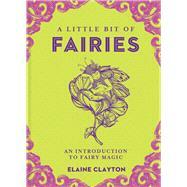 Interact with fairies and tap into their powerful magic with the help of this accessible guide. Whimsical and lyrical, this book explores what and who fairies may be and is sure to intrigue everyone who wants to acquaint themselves with these otherworldly beings. Elaine Clayton takes a look at how we distinguish fairies from angels, how fairies came about, visions and dreaming of fairies, looking for fairy faces in rocks and nature, the co-existence of animals and fairies, and more. Elaine Clayton is an internationally known author, artist, intuitive reader, and Reiki Master, practicing in NYC and CT. Her books on intuitive intelligence include Making Marks: Discover the Art of Intuitive Drawing (Simon and Schuster) and Illuminara Intuitive Journal [Schiffer] She is also the author and illustrator of dozens of books for children, and has provided art for books by Pulitzer Prize-winning author Jane Smiley and Wicked author Gregory Maguire, among others. Elaine teaches courses on the link between spiritual, intuitive development, visual imagery, and creative exploration at her studio, in libraries, schools, and museums. Elaine is a medium and has recorded angel sightings and experiences in sketchbooks for 30 years. You can learn more about her art, books, and readings by visiting elaineclayton.com.